Many people do not really care to demonstrate their individual selfhood or their individual sense of value. Indeed, they very often cannot be said to "use" their possessions; it is the possessions which use them! When one speaks of "possessions" today, most people immediately think of the money they have in the bank, the house and the many gadgets they own, the size of their wardrobe, the make of their car and all that goes with these very concrete and tangible things. These are material possessions; but they are not the only kind of-possessions. We must extend the meaning of the word so as to cover all that the individual "I" can use as his own — and, using it, is able to demonstrate (to make actual, definite and visible) what he is. No one can say "I am" unless he has a tongue and larynx to say it with. No one can be a person here on earth without a body of flesh and bones and nerves. However, there are many people today who think that the body is the person, that out of the body a soul and mind somehow develop, that something happens gradually in the body in childhood which gives rise to the feeling of being "I". If this view is held, it may seem logical to say that the first house of a natal chart refers to the body — because, then, the body — is understood as the beginning of everything. But, in this case, one should realize that the "body" does not begin with birth. The beginning of the body is the act of conception, the fecundation of the female ovum by the male cell. If the body is what comes first in astrology, then the astrologer should make his charts for the time of impregnation and cell fecundation. But one never knows as a matter of fact within minutes or hours the time when this happens within the mother's body, even in the most favorable situations. Thus, the beginning of the body provides a poor start for astrological knowledge. However, astrology was built and has been mostly practiced by men who believed that a spiritual principle or entity — we may call it "soul", ego, "monad" — or whatever we wish — enters or becomes definitely linked with the body at the time of the first breath. This soul entity comes into this realm of life on earth for some basic purpose; it needs a living organism, a human body, to achieve this purpose. It has to exteriorize itself in and through a particular kind of body. It must "incarnate" gradually and always more completely with its individual characteristics; it must release from this body the energies and the powers required in order to fulfill the soul's purpose. Thus, for you, as an individual soul entity, the body is your first and basic possession. You could not be, as a concrete and active person, and proclaim "I am", without owning a body. There is a portion of earth-matter which is your own; it is your body. If this is destroyed (or taken away, as it may be in some rare cases), then you cease to be as an individual person, even though you may be said to remain as a "spirit", a soul or an abstract "I" devoid of physical substance. The first kind of ownership you experience is, therefore, the ownership of your body and of all its (potential or actual) energies. However, this body does not come out of nothing. It is a combination of two lines of ancestors, paternal and maternal; it results from a mixture of ancestral tendencies or, as scientists say today, of "genes". All these things are your inheritance from the past — the past of your family, of your race, of the human species as a whole. Into this blending, this synthesis of many elements inherited from the past, you come. You are the new factor, the at least potentially transforming factor. You have to make something new of all this past stuff if you want really to be yourself as a distinct individual aware of a particular task or work in life. This inheritance from the past has become yours at the moment of the first breath; you have to use it. As we grow through childhood, adolescence and early maturity, we constantly accumulate more possessions. Our body grows larger and heavier because we assimilate foodstuff; and there are many types of food! There is physical food, which we eat; there is also mental food(learning), which we store as remembered facts and ideas. To go through the process of education is to accumulate (and, one hopes, to assimilate) the mental foodstuff which makes your mind develop in a certain way — the way of your national tradition, your culture, your religious inheritance. You also develop through the years something else of the greatest importance: a feeling of value. Some things you feel are good, worth while, attractive — others are bad, worthless or destructive. This sense of value is also, at first, something you inherit from your family and your society; but, gradually, you may transform this inherited sense of value and establish your own values. You come to see as valuable a thing or idea which has proven worthwhile to you, as an individual. Thus, eventually, you own also standards of value which are distinctly your own and which perhaps single you out from your family, your class, your people. You may be utterly bored or repelled by baseball or television and love to pass long hours painting unconventional pictures; that establishes you to some extent as an "individual". People may think you are a freak; some may consider you a budding genius. But if you are not afraid to stand for all the things and ideas which to you are valuable, then you come to regard the conscious and deliberate use of anything you own as an individual responsibility. This, let us not forget, should include the use of your body and all its consciously directed activities; the use of your mind; and, as you grow older and establish yourself in society and in some business or profession, the use of the money you earn, the wealth you accumulate, the things you produce. All this that you own either by the fact of birth in a body, through education, or through your own work — is there for you to use. The problem is how to use it and what to use it for. The problem is there for you to solve in your own individual way and on your own individual initiative. I pointed out last month how the study of the ascendant and of the first house of your birth-chart can help you to discover what your true self is. The planets rising in the first house and the "ruling planet" (ruler of the rising zodiacal sign) suggest, moreover, what kind of activity, or what way of acting, will enable you to express outwardly this true self which you are. The next step is the study of the second house, a study which should be directed essentially toward a keener and deeper understanding of how to establish concretely and substantially your individuality by the very use which you make of what is "your own". However, many people do not really care to demonstrate their individual selfhood or their individual sense of value. They do not want to use their possessions except in the way the average person uses them. Indeed, they very often cannot be said to "use" their possessions; it is the possessions which use them! These people have become identified with their possessions; they become what they own, not what they were meant to be as individuals. They live so as to increase and pass on "property". They carry on the tradition established by the social position of their parents and impress it upon their children; they spend or waste what they own according to the custom of their class or the way an even more temporary "fashion" dictates. They do not want to stand out as individuals; they refuse to stand for anything which is not blessed by the collective sense of value of the average man and woman — the so-called "normal" people! Astrology can hardly tell whether not a person will become an individual and use what he owns (body, mind and wealth) as an individual, for it is every man's supreme privilege to choose his basic orientation toward his self and the use of his possessions. No astrological birth-chart will reveal definitely what this choice will be, but only the terms or conditions of the choice. A person can make such a choice as well in the midst of plenty as while struggling in poverty where the way every cent is spent counts; in vigorous health (where he can do seemingly as he pleases) or in illness (when he must save the smallest amount of vital energy to do what seems necessary). What matters most is not to be told whether one can expect much or little, but in what way one can use whatever one owns in the most individual, the most creative, the most generous, the noblest manner possible. Astrology can help us in this respect — but only if the astrologer understands clearly what the real problem is and that the purpose of possessions is to provide the means by which we may give substance and weight to what we are. We must realizing what we are by using what we own; we must prove what we are, to ourselves and to all men, by this use of our ancestral inheritance and of whatever we come to acquire; we must transform these inherited and acquired possessions to fit the purpose of our true self. These are three basic steps. It is, in my opinion, a serious mistake to think that the second house refers only to the usual kind of material possessions, to finances and to the person's ability to accumulate wealth. The second house refers first of all to whatever a person finds himself endowed with at birth: his body, his vital forces, his parental heredity, his cultural and social heredity. It indicates all that a "soul" is born into. If we believe in reincarnation, the second house refers also to what the reincarnating spiritual entity has built in past lives in the way of powers or abilities — what it is able to bring to the new existence, as a spiritual capital and a power of attraction. 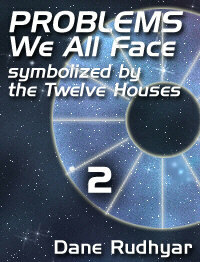 At any rate, the second house is the reappearance in a new body of powers which had been generated in some kind of "past". This is, however, only the first level of interpretation of the second house; the second level refers to the eventual fruition of whatever a newborn inherited at birth, as he grows up to active manhood or womanhood. We are all born with a capital — our body, our inherited mental abilities, our culture and social position. To become a mature person is to make this capital bear fruit. When we earn money, acquire property, gain friends and accumulate intellectual wealth, we simply make our birth endowment bear valuable fruit; we do it through our own efforts and often through "luck" — whatever this exactly means. At this point, the reader may confused by the fact that astrological textbooks speak of the eighth house, not the second house, as the section of the chart referring to inheritance and legacies. The "legacies" to which the eighth house refers are those which come to a person as a result of the relationships he makes or he keeps warmly alive through his life (seventh-house matters). On the other hand, the second house represents the native endowment of the soul, the natural hereditary transfer from parents to children. This transfer is unconscious; it is not a deliberate gift of one individual to another. It is heredity rather than inheritance. Where something is bequeathed as the this refers to the eighth house because it follows after a conscious relationship between two persons. Actually, when the astrologer considers the second house as that representing the money earned, the goods acquired, this is only half correct; all that man gains, while engaged in business or in any productive activity which depends upon some type of human exchange (physical goods or ideas), is basically an eighth-house matter because it is the result of human relationship (seventh house). Thus, strictly speaking, what the second house reveals is the individual's characteristic way of approaching the problem of (1) how to use what he is born with; then (2) how to orient the use of his inborn muscular strength, mental abilities, intuitions and of his social position so as to enter into fruitful relationship with other people — relationships and partnerships which will, in turn, make for him wealth of some sort. This "characteristic way" indicated by the second house is the way in which the individual truly reveals himself — the more so, the more of an individual the person is. It may not be at all, however, the way the individual will become rich, for it may not be his individual destiny that he should become rich in earthly goods! How can the astrologer determine what is this "characteristic way" in which the individual tends to use what he owns? First, we should study the zodiacal sign at the cusp of the second house of the exact natal chart and the position and aspects of the planet "ruling" this sign; second (and this may be even more important), the meaning of any planet, if any, found in the second house. It is my opinion that the cusp of the second house refers, generally speaking, to the basic attitude of the individual toward what is his own by right of birth. The planet ruling the zodiacal sign on this cusp indicates the type of activity through which this basic attitude is normally best exteriorized. If any planet is located in the second house, this planet refers more particularly to the type of activity by which the individual, as he grows up, is willing and able to acquire wealth or possessions. Any birth-chart must be judged as a whole. The natal houses represent the twelve basic "fields of experience", acting through which a man comes to realize who he is as an individual and, thus, gains maturity. The keyword here is "experience". A person must experience. He must dare to experience all that comes his way, at least once so that, by solving the many problems which such experiences and their results produce, he may become in full possession of his powers and faculties as an individual. This "full possession" is the ultimate goal of all second-house experiences. Physical goods or money, houses and bank accounts do not guarantee such a full possession of one's powers and faculties; indeed, they often hide the main second-house problem and the way it should be solved. "Full possession" comes only through significant, purposeful and creative or transforming use. Only, the possessions which are thus used help the owner to reveal and to experience his real self, as an individual.